Why do most new products fail? According to Clayton Christensen, the author of Competing Against Luck: The Story of Innovation and Customer Choice, it’s because companies focus on a product’s features instead of the job the customer wants it do to. In this piece, Knowledge@Wharton reviews the book’s assertions and highlights how they were put to practical use in various industries. Three years earlier, Clayton Christensen (along with co-authors Taddy Hall, and Scott Cook of Intuit) had written a piece for the Harvard Business Review called “Marketing Malpractice.” He argued that American companies had lost their way by becoming preoccupied with segmenting markets by ever smaller slices. They collected data to measure the needs of those slices, and then used more data to gauge their progress in meeting those needs. But because they were asking the wrong questions, companies were often solving “the wrong problems, improving their products in ways … irrelevant to their customers’ needs.” What was needed, he concluded, was a new model: a new lens for asking the right questions, and for measuring progress toward the goals that emerged from those questions. 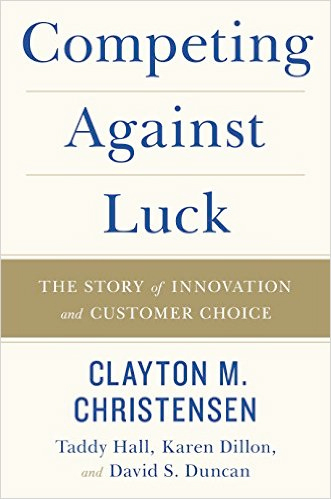 That article laid the groundwork for Christensen’s new book, Competing Against Luck: The Story of Innovation and Customer Choice, written with Hall and two co-authors. It is a direct critique of Anderson’s data-driven view, and a vigorous defense of the importance of theoretical models. Solid theory, he says, tells us what data to look at, and how to look at it — transforming innovation from a hit-and-miss process to a deliberate one guided by purpose, and a clear vision of a job to be done. Christensen (a professor at Harvard Business School, and the author of nine previous books) has been wrestling with the elusive goal of innovation for a while. A recent McKinsey poll of global executives finds that the vast majority value innovation as “extremely important” to their growth strategies, “yet a staggering 94% were unsatisfied with their own innovation performance.” This shortfall comes depite the fact that “businesses have never known more about their customers,” and appear to have “structured and disciplined” systems in place for putting all that data to good use. Going back to his days with the Boston Consulting Group, Christensen was puzzled by why so many “once-great” companies seemed to go stagnant and stale, particularly in the face of competition from upstart rivals. He pursued the question as he returned to Harvard for his doctorate, research that led to a theory of “disruptive innovation” and to his first book, The Innovator’s Dilemma. Since then, disruption has become a popular buzzword — one “misapplied so broadly as to mean anything that’s clever and new.” But more to the point, it only explains the past, and in retrospect. It offers no clues as to where to look for new innovation. Meanwhile, companies are “awash” in data that is also retrospective and focused on buying patterns, customer satisfaction with current products, and similar metrics. Noted economist Theodore Levitt was fond of telling his students, “People don’t want to buy a quarter-inch drill. They want a quarter-inch hole.” The quote is widely cited, but not, according to Christensen, properly taken to heart. Marketers and would-be innovators tend to measure past performance and set future benchmarks based on the “features and functions” of the drill, and not the customer’s experience of trying to get the right hole. The focus on product is understandable, because it so easily translates into quantifiable data. It also implies agreement with Chris Anderson’s assertion that “correlation is enough,” because what a lot of the number-crunching companies do involves inferring connections between the characteristics of customers and the products or services they buy. The patterns this data seems to reveal may be “seductive,” yet Christensen said that unless companies understand why customers make the choices they make, all that data is unlikely to lead to consistent innovation. The author’s insistence that correlation is not enough, and that the key is causality, has prompted him to supplement his previous theory of disruptive innovation with what he called the ‘Theory of Jobs to Be Done’ (or Jobs Theory for short). The only important question a company should ask about a given product or service is this: What job is the customer “hiring” it to do? It’s a question that is deceptively simple in the asking yet turns out to be nuanced and layered when applying in practice. Data can be helpful. But Christensen’s call for a ruthless focus on the “causal mechanism of customer behavior” yields an approach that is almost sociological in nature — and involves a holistic analysis of the experience of choosing, and then using, a given product or service. And it is in the shaping of that experience that companies will find the potential for innovation and sustainable competitive advantage. Yet his brand of theory is not academic or abstract; it is “quite the opposite,” concerned as it is with “the supremely practical question of what causes what.” He is advocating for an almost granular understanding of the customer in his or her “moment of struggle” as they try to move toward a particular objective under very particular circumstances. In the end, the ‘Jobs Theory’ is a kind of lens for the author, and he means that almost literally. He suggested a thought exercise in which you imagine “filming a mini-documentary of a person struggling to make progress in a specific circumstance.” What is the customer trying to achieve? What is the social context of the decision? What obstacles or trade-offs are involved? Christensen’s emphasis on the specific circumstance of the “hiring” decision stands in contrast to the typical focus on things like product attributes and customer characteristics. Yes, features and functions are important; but purchase decisions have a social and emotional dimension as well. And the traditional focus on customer needs is insufficient in explaining actual decisions in the real world. You might “need” to eat but still choose to skip a meal; or you might eat when you’re not actually hungry. Only a deep dive into a particular circumstance can explain why. Companies that have successfully examined what they do through the lens of the ‘Jobs Theory’ end up with a fundamentally altered sense of their brand mission, of who or what they are competing against and of the limits and possibilities of their market. Intuit, for example, noticed that small business customers were using its personal financial software product, Quicken, to help with their business accounting. From a strictly functional viewpoint, the decision made no sense: Quicken lacked many of the features of other successful business software on the market. But it wasn’t the product (accounting software) that mattered. It was the process, the job to which small customers were putting it to use — which turned out to be simple bookkeeping, the basic mechanics of moving money around. This new “job insight” led to the development of QuickBooks, an unlikely success in that it offered half the functionality of more sophisticated software at twice the price. But Intuit realized they weren’t competing against other accounting software — they were competing against the alternative of hiring a full- or part-time bookkeeper. The biggest obstacle to “hiring” Moesta’s company wasn’t the features it was or wasn’t offering but the anxiety around giving up an accumulated life. Moesta realized he was in the business of moving lives, not of condo construction, and realigned the company accordingly. They simplified the menu of features; expanded the dining rooms so people could fit their old classic dining room tables; and added moving and storage services. In 2007, even with the industry down 49%, the company’s sales went up 25%. Paul LeBlanc took a similar approach in helping Southern New Hampshire University take advantage of the market for online learning, which was relatively unexplored back then. Prospective “distance learners” would be hiring SNHU for a very different job than traditional campus students, and the experience was an entirely different one as well. Framing products or services as ‘Jobs to Be Done’ can help companies reinvent themselves. It can also enable them to see their potential market in an entirely new light, and to uncover new jobs hidden in plain sight: needs and aspirations not adequately addressed by current offerings. Through the lens of the ‘Jobs Theory,’ Christensen argued, companies can see that in some cases they might not be competing with other companies, but with “nonconsumption.” SNHU, for example, wasn’t competing with traditional universities; it was competing against “nothing,” the option of simply not continuing one’s education. Similarly, Airbnb found that 40% of its guests wouldn’t have made a trip at all if the homestay network didn’t exist. Thus, they aren’t competing against traditional hotels, but against nothing: the decision not to take a trip. Unmet needs can be discovered in other ways as well. Sometimes, customers will compensate for inadequate choices with “cobbled-together workarounds” — such as small business customers using a product intended for personal finance. Unusual uses of an existing product can also be clues about new potential markets. Vicks realized that customers were taking NyQuil even when they didn’t have a cold because it helped them sleep; from this new insight, ZzzQuil was born. “Negative jobs” — tasks people will go to great lengths to avoid — can also offer new opportunities for those astute enough to spot them. A parent of a child reporting a serious case of sore throat faces a series of obstacles in acting on that knowledge: tracking down the pediatrician, getting an appointment, and then waiting for a prescription to be filled if indeed it turns out to be strep. CVS MinuteClinics streamline that process, and there are now more than a thousand locations in 33 states. Identifying a job, hidden or not, is one thing. Creating a desired set of experiences around the product or service performing that job is another thing. It is a kind of advanced stagecraft that involves anticipating and addressing needs, obstacles, and anxieties at every stage of the process. But if they get it right, it is here that companies can find a clear and sustainable competitive advantage. American Girl has built a wildly successful business by carefully crafting the experiences of those purchasing its dolls. The dolls themselves are lovely and sturdy, but hardly amazing. Competitors have tried to duplicate them, and at a fraction of the price. But what they haven’t been able to duplicate is the experience surrounding the dolls: everything from the aesthetic of their stand-alone stores, to the sensual details of opening the box, to the rich backstory behind each doll’s character. Competitors weren’t “willing to put the depth in the product to create the experience,” says founder Pleasant Rowland. “They thought it was a product. They never got the story part right.” If you do get the story part right, Christensen contended, you can practically “inoculate” yourself against potential disruption from a rival upstart. IKEA is another company that has built a long-term competitive advantage through careful attention to the details of the customer experience. At first glance, the author said, it doesn’t appear to have any special business secrets. “Any would-be competitor can walk through its stores, reverse-engineer its products, or copy its catalog. But no one has.” Christensen contrasted this crafting of a singular customer experience with the crowded field of discount retailers like Walmart and Target — an industry organized “not around a job, but around products and price points.” As a result, these companies have to constantly “fight tooth and nail” for market share. A fine-grained understanding of the ‘Job to Be Done’ by a product or service, and then of the desired experience surrounding its purchase and use, can provide companies with a detailed list of specifications they must meet in order to satisfy customers. But the real challenge, Christensen said, is organizing a company around the consistent delivery of that job across geography, function and bureaucracy. All too often, the culture of the typical company — its rigid organizational chart, isolated functional silos, focus on internal metrics and market segmentation — conspires against that kind of integration. Part of the problem is paying attention to the wrong things. Metrics matter but only if they’re focused on customer benefits. SNHU, for example, carefully tracks its response time to inquiries from prospective students. Amazon is relentless with its performance metrics, but the essential ones are all from the point of view of the customer. It focuses on when a product is delivered, not when it is shipped. Such metrics are inherently about effectiveness, not efficiency. Yet it’s easier to track efficiency, and many companies get “seduced” by all the data such tracking generates. Complicating matters is the fact that product-based data tends to be “noisy,” while process-focused measures are subtler, and more elusive. “Managers feel an understandable sense of reassurance when they shift their attention from the hazy contours of a story of struggle to the crisp precision of a spreadsheet.” Quantitative data can seem more trustworthy, and more comforting, than qualitative data. Excellent work to Clayton and the co-authors. To quote Ralph Waldo Emerson “As to methods there may be a million and then some, but principles are few. The man who grasps principles can successfully select his own methods. The man who tries methods, ignoring principles, is sure to have trouble.” I believe the innovation space is still filled with too many methods without principle. What Clayton is attempting is to move towards the principles behind innovation. The best test for “Jobs Theory” would be to explain how Henry Ford could have approached taking his car invention to the market. Can anybody help to explain the job the car was hired for in those days?